Plus extra room to walk around all the stuff! You've got a lot of stuff!Hoping you'll find a large enough apartment there! What kind of fish do you have? We had Koi, and goldfish, too, at the farm. They were very calming to just sit and watch. 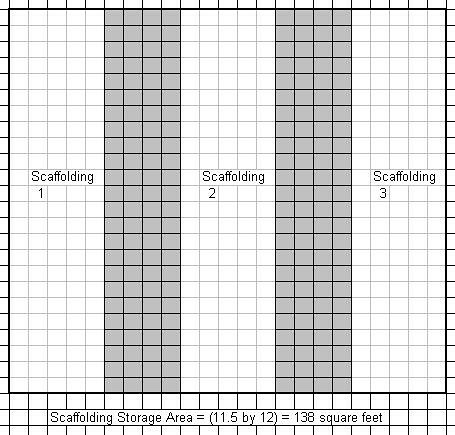 What's the scaffolding look like? Wow! What does the Dog Bed look like? 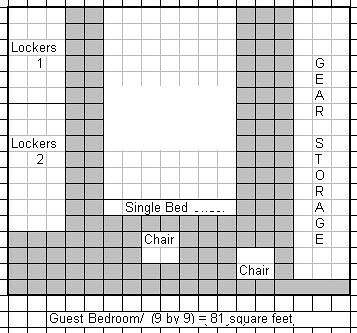 with the amount of stuff you have and the area you need around it, I suspect you are talking about 1000 sq feet at least, from the looks of it, you have not left a whole lot of room to actually manuever through the place. Two feet between chairs, 6 inchs between a couch and tables, neither of those are standard spacing. Man oh man do you have a lot to learn about living in NYC. 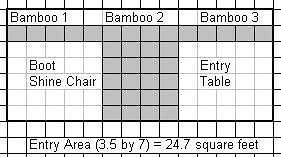 Exercise area? we call that a gym. 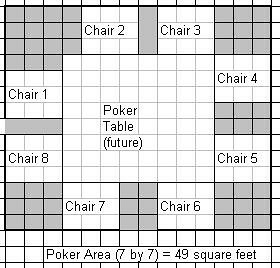 Poker area? 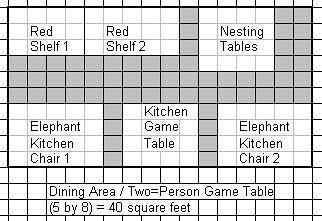 Thats the coffee table or dinner table or folding table. 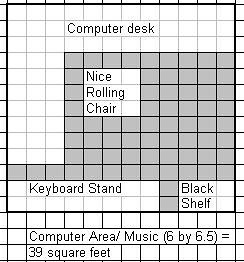 Computer/music area, thats called a laptop. Storage area? thats called a storage rental room. Kitchen? thats called a diner. Good lucj. Don't just look at seomthing that is affordable at todays rents, but at tomorrows rents when the economy starts to come back. A friend of mine moved to the The Sequoias SF, and had about 600 sq ft to deal with (moving from a large home). So he had a Murphy bed constructed, which I think is one of the best inventions ever(aside from lube)in dealing with tight space. Where does the cage go? & I'll need more space just for my boots -- or maybe you can sleep on top of a pile of them instead of the dog bed! 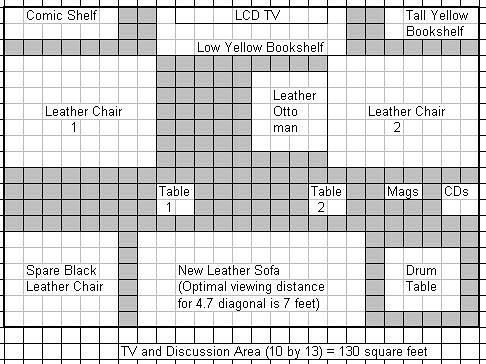 Those oblong graphs are confusing... some of the chairs look enormous, and some like doll furniture. I believe this is the one that has a trundle bed (king!) that disappears under the dining area platform. It's what I was about to do in my condo (435 sf!). In looking at what you were showing, I was thinking is this just for you or for you and Thor? 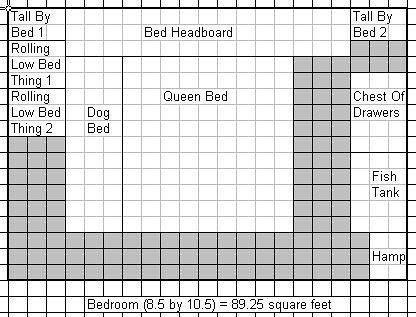 If for both, double that space, 600 Sq Ft 1 bedroom are NOT huge by any means and that would be somewhat large by NY standards I would bet and that's what I live in here in Seattle. My living room area is roughly 11x9Ft in a space that is 11x17 that also has the dining area and think of doorways and glass sliders and hallways too as they take up space along walls where furniture would otherwise go and thus the need to take into consideration for traffic patterns throughout the space. In my case, due to the slider making the outside west wall shorter, it limits me in how I can comfortably arrange my furniture since the space isn't very deep in one direction and after thinking about it a lot, the couch can only fit on the wall that backs up to the bedroom without feeling wedged in but it puts my couch where one can enjoy the view from it so it works. For small space living I'd suggest you peruse through Apartment Therapy for idea and books on small spaces to see how to handle them without making them feel cluttery. I didn't know you had a dog! You might want to reconsider the guest bedroom and invest in a larger one bedroom with a comfortable pull out sofa. Yes, they do exist; check out Carlyle Custom or Room & Board. And try to incorporate storage in every last thing you buy! Wow, some great advice! Thanks! I hope we have room for Thing 1 and Thing 2! I know I'm late, but ... just get rid of most of it. SERIOUSLY. part of the fun is looking for "just the right thing" and in a NYC apartment, you really do have to be selective. Just ask Ms. 400sf.